In Part 1, I explained that a number of French and English pointing breeds are in dire straits in their own homelands. In this article I would like to take a closer look at the situation in France. Currently, nearly 225,000 dogs are registered annually in France, about the same number as are registered in the UK, and three times the number of annual registrations in Germany. In America, AKC registrations are in free fall, but in France, the numbers continue to rise. Clearly, the French love pedigreed dogs and French hunters love hunting over pointing dogs. In fact, France is the only nation on the planet where over 30 different foreign and domestic pointing breeds are available locally. Breed registration statistics published by the French kennel club also reveal that in almost every FCI group, the top three breeds are foreign. Group 1: German Shepherd, Malinois, Australian Shepherd. Group 2: Bernese Mountain Dog, Cane Corso, Boxer. On average, French breeders register over 15,000 pointing dogs every year, and some of the French breeds are doing very well. The Brittany is in the top 30 list of all breeds worldwide and the second most popular gun dog in France. The Griffon, French Spaniel and Braque Français seem to be in reasonably good shape as well. But over half of all French pointing breeds, 6 out of 11, register fewer than 100 dogs per year, a number generally agreed to be the minimum for a breed to remain viable. Worldwide, it is estimated that among all breeds of dogs, 17% have fewer than 100 registrations per year. Among the French pointing breeds, it is over 50%. What can explain such massive discrepancies? Why are some French pointing breeds in good shape and others just barely hanging on? Could it be that some breeds are simply better than others? I don't think so. I wrote my views on that issue here and here and concluded that "If we really want to understand why a breed is the way it is today, we have to look at history, geography, politics, breed clubs, registries and a bunch of other things, most of which are totally unrelated to how it actually performs in the field as a hunting dog." Is it because of the declining number of hunters in France? Maybe. The graph below shows a relatively rapid decline of hunter numbers in France over the last 40 years, and a massive increase in the overall number of dogs registered (all breeds). Meanwhile, in comparison, the number of pointing dogs remained more or less stable but declined as a percentage of overall registrations. In 1970, nearly 10% of all dogs registered in France were pointing dogs. By 2016, that number had dropped to just over 2%. Number of hunters in France compared to the number of dogs registered. If we dig a bit deeper into the numbers, we start to see evidence that the decline of some breeds may indeed be due to the decline in hunter numbers in France. 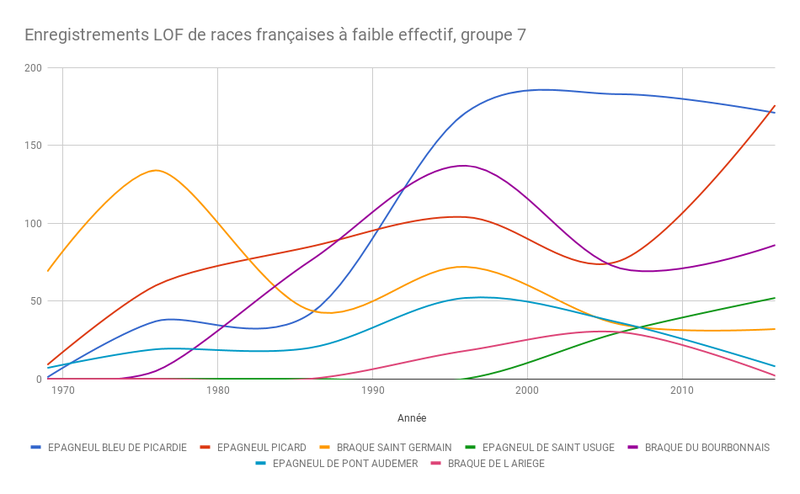 The graph below shows average annual registrations in France for the most popular French and English pointing breeds. It reveals that since the late 1990s, most of the French pointing breeds, including the Brittany, have seen their numbers decline at an increasing rate. Among the British and Irish breeds, the Pointer has also seen a decline, but the English setter continues to outpace all other breeds, overtaking the Brittany as the most popular gundog among French hunters in the early 2000s. Today, the English setter, classified as a "vulnerable breed" in its homeland, is the 19th most popular of all breeds in the world! As I argued in a previous article, once a breed reaches a certain level of popularity (economists might call it 'market penetration') it generates a tremendous amount of sales momentum just by being popular. And that momentum can build to a point where a single breed can gain a near monopoly in the market. This appears to be the situation with the English setter in France and elsewhere in Europe. For over 100 years, in every corner of France, French hunters looking for a pointing dog almost certainly had friends and/or family members that owned Setters and probably even knew someone in their local area with a litter of Setter pups for sale. So why would those hunters chose any other breed, let alone a rare breed that they'd never even seen before? After all, some French breeds are so little-known that even in the region in which they were developed, many locals have never even heard of them. When my wife and I visited Pont-Audemer (Normandy, France), the town for which the Pont-Audemer Spaniel was named we were shocked to realize that none of the residents we met there had ever seen a Pont-Audemer Spaniel and most of them did not even know there was such a breed. I've heard similar stories from friends visiting other regions of France where they expected local hunters to at least know about the regional breed. Instead, what they found were men and women too busy with their English Setters to pay any attention to the braque or épagneul "du pays". Finally, here is one more graph. It shows the average annual registrations for the rarest of the French pointing breeds between 1969 and 2016. The first thing that stands out is that rare French breeds seem to be prone to boom-and-bust cycles where every few years their numbers increase, only to nose dive a short while later. Of course the highs and lows simply reflect the fact that an additional litter or two in any given year for a breed registering fewer than 100 dogs per year can mean an immediate jump of 20% or more. But it also suggests that breeders of the rarer breeds produce litters only occasionally and very few of the folks purchasing their pups end up starting their own breeding programs afterwards. Something seems to have happened in the 1990s and early 2000s. In the first half of the 1990s, programs to save the Braque de l'Ariège and the Saint Usuge Spaniel were formally established and efforts that had begun in the 1970s to revive the Braque du Bourbonnais were paying off. Even the Pont-Audemer Spaniel and the Braque Saint Germain seemed to be on the rise at the time. However near the end of the 1990s and then into the early 2000s, most pointing breeds saw their numbers decline. But there were a few outliers. In the early 2000s, as most French pointing breeds began to struggle, the Saint Usuage Spaniel, a breed not even recognized by the SCC until 2002, overtook three much older French breeds. In addition, the Blue Picardy's numbers continued to rise throughout the 1990s, but leveled off after 2000 and started to decline around 2010. Then, in 2015, the Picardy Spaniel's numbers surpassed those of the Blue for the first time since the early 1990s. In fact, 2017 may have been a record year for the Picardy with over 200 registrations for the first time in its history. So how did a few rare French pointing breeds manage to increase their numbers while most of the others declined? In my next blog post, I will offer one possible explanation. If I'm right, it may offer hope for the breeds that continue to struggle. Click to read Part Three.